Many Americans are affected by hoarding in one way or another, whether they are hoarders themselves, live with a hoarder, or know someone who hoards. Some may view hoarding as a refusal to throw anything away, but it goes much deeper. 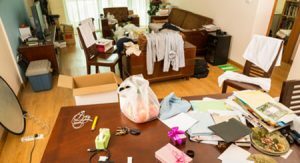 Hoarding is classified as a mental disorder with a high level of anxiety that prevents those affected from throwing anything away, resulting in a huge buildup within the home. This buildup of materials can become dangerous by restricting access throughout the home and creating conditions for mold, bacteria, and other harmful substances. ServiceMaster NCR provides hoarder cleaning services to clean and restore the homes of hoarders in Lorton, VA. Our technicians will remove unwanted items and sanitize the home while keeping the affected individual involved in the process. People affected by hoarding do not have the ability to throw anything away which causes their homes to gradually fill up with items such as newspapers, food containers, broken items and appliances, and general trash. As the condition of the home gets worse, the hoarder often becomes embarrassed by the condition and will not let anyone inside the house. This is why a close friend or family member whom the individual trusts must intervene and help them understand that they need to get help to clean their home. The technicians of ServiceMaster NCR understand how difficult this situation is for the individual and we make sure to treat them with a sense of compassion and respect. We also make the individual an important participant in the process, giving them the final say on the fate of the hoarded objects. Our technicians are fully prepared to handle any case of hoarding and restore the home to a safe condition using advanced cleaning products and equipment. We are certified and insured to provide intense cleaning for the homes of hoarders and we work to build a personal relationship with the affected individual so they can be part of the cleaning process. If we encounter dangerous biohazard materials including dead animals, bacteria, or others, we have the equipment to safely remove them. –Decontamination: We work with the affected individual to remove unwanted hoarded items and then deep clean and decontaminate the entire home. –Deodorization: We completely remove any unpleasant odors with our powerful deodorizers. –Proper Disposal: Unwanted items are disposed of, recycled, or donated and biohazard materials are transported to a licensed medical waste facility. Hoarding should never be overlooked because it can very quickly start to create dangerous conditions in a home that can affect the health and safety of the individual and their families. Make sure you call ServiceMaster NCR if you have a friend or family member in Lorton, VA that could benefit from our hoarder cleaning services. You can reach us at (703) 212-7000 for more information about these services or to schedule an appointment.